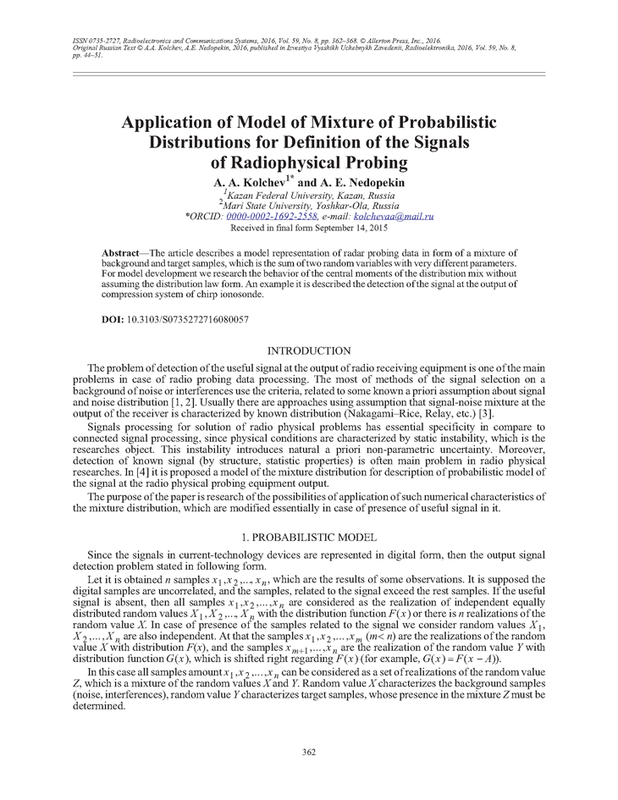 The article describes a model representation of radar probing data in form of a mixture of background and target samples, which is the sum of two random variables with very different parameters. For model development we research the behavior of the central moments of the distribution mix without assuming the distribution law form. An example it is described the detection of the signal at the output of compression system of chirp ionosonde. SHIRMAN, Y.D. Theoretical Principles of Radiolocation. Moscow: Sov. Radio, 1970 [in Russian]. TRIFONOV, A.P. ; NECHAYEV, Y.P. ; PARFENOV, V.I. Detection of Stochastic Signals with Unknown Parameters. Voronezh: VGU, 1991 [in Russian]. STEIN, S.; JONES, J.J. Modern Communication Principles with Application to Digital Signaling. McGraw-Hill, 1967. KOLCHEV, A.A.; NEDOPEKIN, A.E. On one particular model of a mixture of the probability distributions in the radio measurements. Computer Research and Modeling, 2012, v.4, n.3, p.563-568, http://crm-en.ics.org.ru/journal/article/1925/. KOLCHEV, A.A.; SHUMAYEV, V.V. ; SCHIRYI, A.O. Equipment for research of HF ionospheric multipath propagation effects. J. Instrum. Engineering, 2008, v.51, n.12, p.73-78, http://pribor.ifmo.ru/en/article/4646/izmeritelnyy_kompleks_dlya_issledovaniya_effektov_mnogoluchevogo_ionosfernogo_rasprostraneniya_korotkih_voln.htm. KOLCHEV, A.A.; SHPAK, D. Estimation of the transfer ratio frequency characteristic of HF radio channel by using the LFM signal. Radioelectron. Commun. Syst., 2010, v.53, n.12, p.663-667, DOI: http://dx.doi.org/10.3103/S073527271012006X.